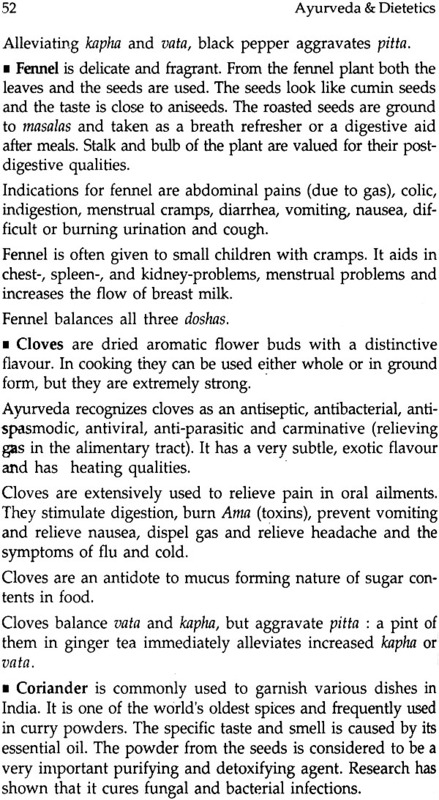 Dr. Anil K. Mehta is a well known international figure in Ayurveda. He runs an Ayurveda college in Netherlands and Belgium since 1980. Dr. Mehta has so far trained more than 1000 European doctors and therapist in Ayurveda. He has written more than a dozen books on the subject in Dutch and English. Ayurveda in de Praktijk in Dutch and Ayurvedic Physiotherapy & Yoga in English are most popular. His other equally popular books are Why Ayurveda? 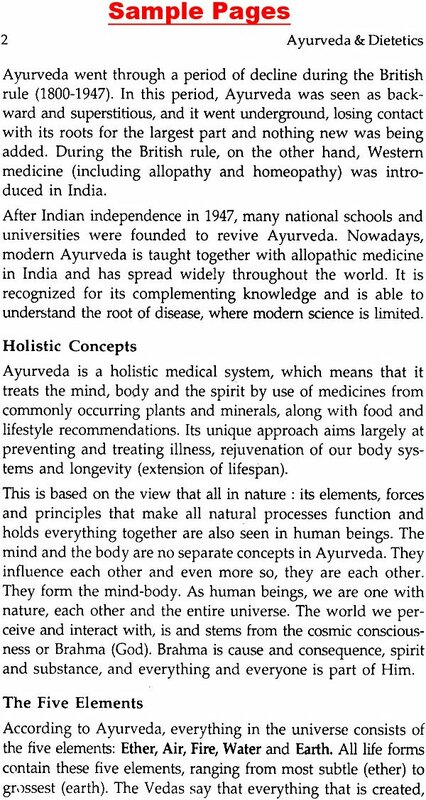 Open Your Eyes to Ayurveda and Health and Harmony through Ayurveda in English language. He has been awarded "Vishwa Ayurveda Shiromani" title, literally means World topmost Ayurveda Physician by a renowned D.A.V. Educational Society. Dr. Mehta is a founder director of EISRA (European Institute for Scientific Research on Ayurveda) which is affiliated to Gujarat Ayurveda University, Jamnagar, Gujarat, India and D.A.Y. Ayurveda College, Jalandhar, Punjab, India. 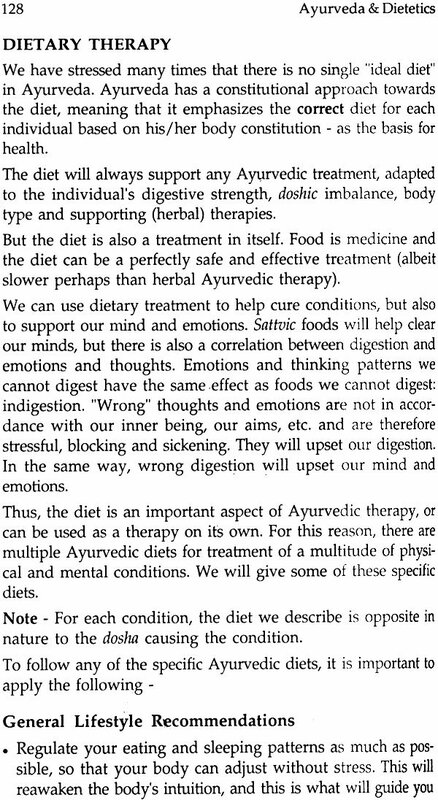 The role of the diet is extremely important in Ayurveda. The right diet is considered to be responsible for the maintenance of good health and the prevention and cure of disease. The contemporary science of nutrition and dietetics was developed to wards the end of the 18th century and developed a vast knowledge about "the contents of food": minerals, proteins, carbohydrates, vitamins etc. Food was measured according to its nutritive value and weighed in quantities. Modem dietetics has taught us to "count calories" and that we need food to build and shape our physical body. Nutritional needs are measured in terms of calories and quantities, and we are advised to take certain amounts of specific food groups. 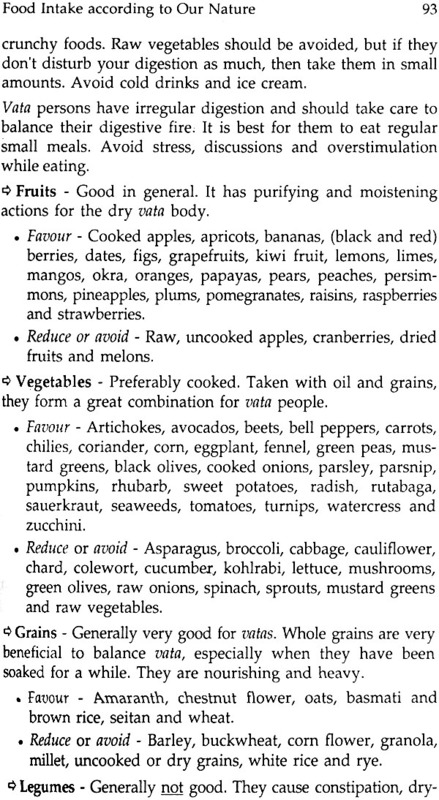 It is exactly this part of modem dietetics I wanted to counter- balance with this book. 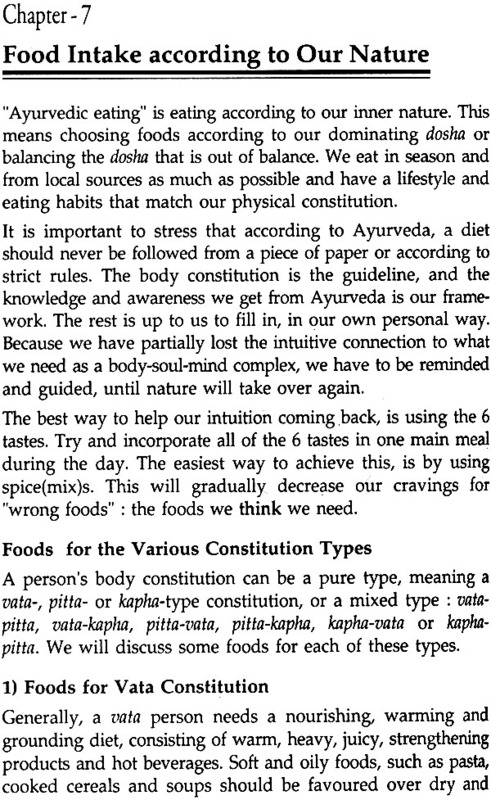 The ancient Ayurvedic texts describe the qualities of food and divide them in three categories sattva, rajas and tamas. These are the qualities of all things in life - and are mental qualities as well. However the value of food in Ayurveda goes far beyond this classification; food is valued in its relation to the climate, environment and season. Food contains all Five elements - water, fire, earth, air and ether, which are present everywhere and constitute our individual bodies in a very unique way. The body is not merely physical, it is mental and spiritual as well. With choosing foods according to our real natural needs and not just to our physical needs, we support all our bodies (physical, mental and spiritual), and express our true nature. 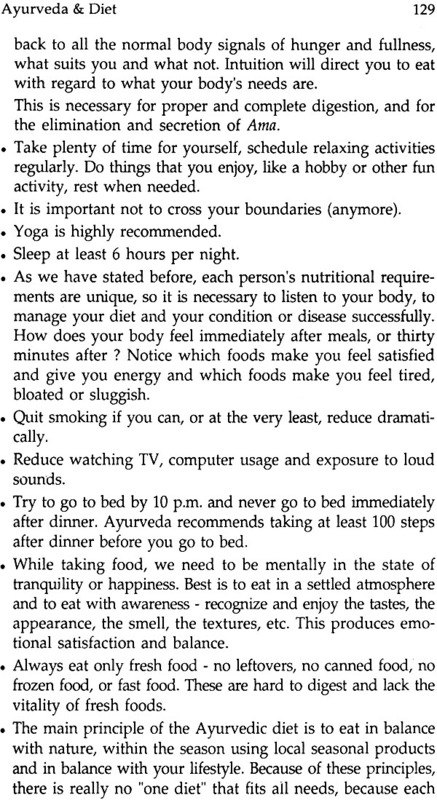 In Ayurveda, the diet forms the main part of the treatment for any ailment. 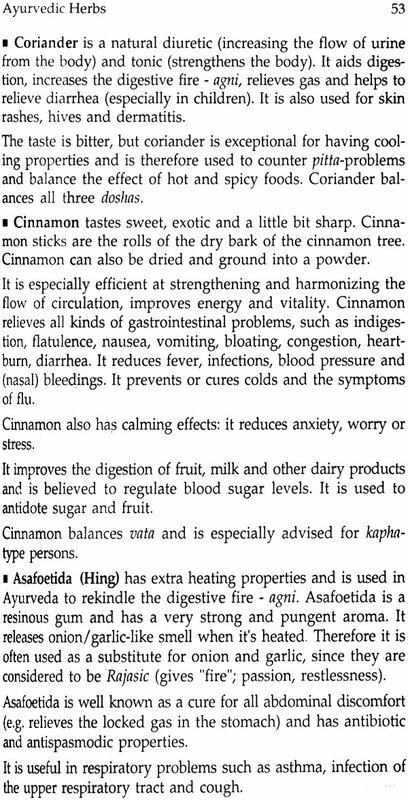 It is the first and foremost pillar of health, because of its necessity for the growth of the body strength and immunity. In my view, there is a tremendous richness in the Ayurvedic perspective on food and I am convinced from my personal experiences with my clients, students and international experiences and contacts that the need for this perspective is ever growing. In our clinic, the Prakash Deep Institute in Raiwala, northern India, we are specialized in Panchakarma treatments. Panchakarma is Ayurveda's most extensive detoxification and purification program, which eliminates deep-rooted stress and toxins, eliminates disease and protects the body by strengthening immunity. 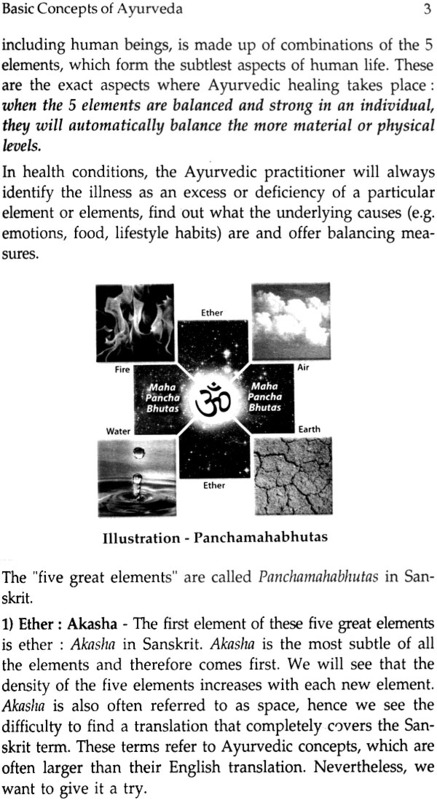 Panchakarma would not be effective without a specialized diet. We are deeply aware of this and that's why every client's individual diet, may it be purifying, strengthening or balancing, is monitored and adjusted on a daily basis. As a doctor, I have an almost lifelong experience with health problems, health needs and the success of the Ayurvedic diet. It is my golden rule that the foundation of health is following a diet, exercise and lifestyle, according to our very own body constitution. The process of developing a healthy life perspective is already extremely powerful on its own and resonates deeply in our body and soul, where it connects to our hidden.